This is yet another quick and easy DIY present that will provide a wow factor. The items needed can be found at the craft store and a beauty supply store. Heck, I even found the bobby pins at my grocery store, so this is fool-proof. 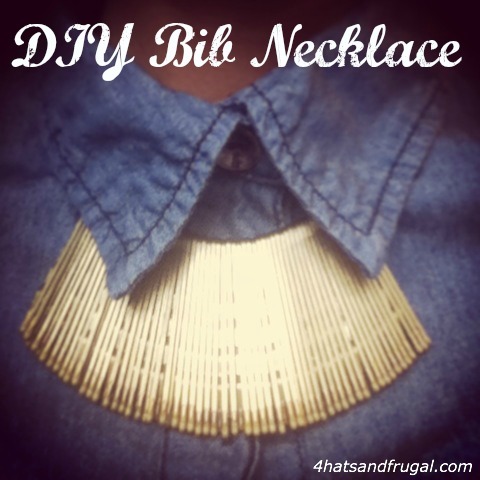 Step 1: Take your necklace and measure to desired length. If you would like it longer, then only clip on a small amount. I measured around my own neck to see where it landed. If you are looking for a bib necklace that’s more like a choker, cut off a good amount. You can always cut off more later if need be. Step 2: Slide your bobby pins onto the necklace. The more you put, the grander the necklace will be so this is where you have artistic prerogative! You can also use the long roller pins in the middle, and place an equal amount of smaller pins on each side of the large pins. Whatever floats your boat. Step 3: Place on a piece of paper and spray paint your pins. If you are planning on painting them a bright color, completely cover the chain with tape then spray the bobby pins. Step 4: After the bobby pins dry, it’s ready to give away! I placed the one I made in a cute box with tissue paper. Then, I made one for myself (pictured above)!